Former Porsche CEO Wiedeking (left) and ex-CFO Haerter (right) and are on trial in Stuttgart. 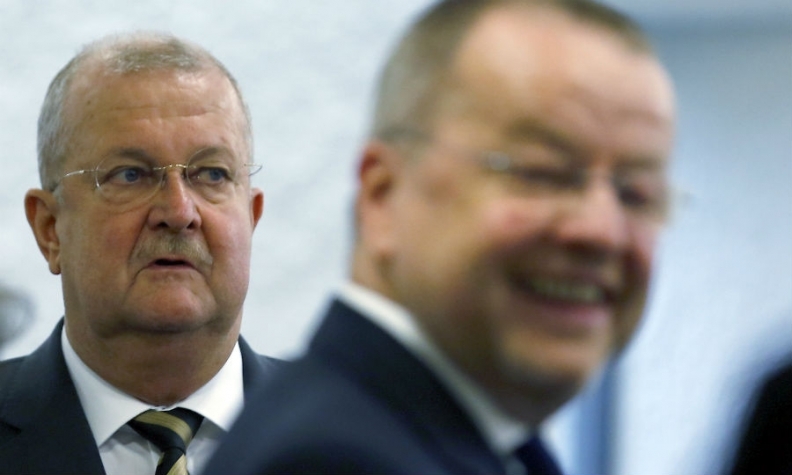 STUTTGART (Reuters) -- German state prosecutors said they are seeking prison terms for former Porsche CEO Wendelin Wiedeking and ex-finance chief Holger Haerter, who are accused of having manipulated Volkswagen shares during a failed takeover of VW in 2008. As part of a criminal trial in Stuttgart, the prosecutors accuse Wiedeking of pursuing plans for the sports-car manufacturer to take over much larger VW while making public statements to the contrary. Haerter also faces the same charges. Prosecutor Heiko Wagenpfeil said on Thursday he would seek a prison sentence of two years and six months plus a punitive fine of 1 million euros ($1.1 million) for Wiedeking and a sentence of two years and three months for Haerter. He is also seeking a punitive fine of 807 million euros for Porsche SE, formerly the owner of the Porsche sports-car business and now a holding company that is VW's largest shareholder. The court is scheduled to deliver a verdict on March 4.